Along side a range of archtop and hollow body guitars, Texas luthier Chris Forshage of Forshage Custom Instruments builds an exciting hollow body electric guitar that takes ergonomics seriously. The result is a unique instrument which is lightweight, well-balanced and comfortable. Coming up soon – Due to the generosity of Building the Ergonomic Guitar reader Dr. Marc Ybaben of the jazz group, The Marc Why Group, we’ll have an opportunity to see elements of this guitar during the build process. Marc currently has one in the works and has been kind enough to share a number of pictures showing various details. I had the pleasure of meeting Chris when his band Ohn (fantastic band, by the way… do check them out!) played in Toronto a while back. He was playing what I assume was the prototype, and as soon as I saw it onstage, I knew I had to ask him about it. Chris was kind enough to let me pluck at it, though I didn’t have the chance to actually play it much… and it was something else! I was in touch with Chris a short while ago to ask him for some more details on that guitar (I am planning my own headless, though I finally realized I don’t have a shop, so it’s being comissioned). It occurred to me to suggest he check out “Building the Ergonomic Guitar,” at which point Chris told me that he’d already been exchanging communication with Robert. Looking forward to those build pictures– I didn’t actually know until today that Chris was building another ergonomic guitar. Exciting! Very cool, Greg! I wasn’t aware of the band – I’ll have to check them out. Meanwhile, I’m looking forward to sharing the pictures Marc provided of his guitar in progress. The only guitar I can play is the one one guitar hero. I like it! Has sort of an “abbreviated Breedlove” thing going on. Cool top wood and sound hole. Y’all are on to something! I definitely think Chris Forshage has something with his design. I’d love to see a solid body version of this one as well. Inspirado por varios diseÃ±os, Chris Forshage demuestra una vista moderna del instrumento…. I would point out that youth is no guarantee against health issues like Repetitive Stress Injury or other musculoskeletal disorders like chronic back pain. Our culture increasingly exposes us to activities that can lead to these conditions. Do you play video games, work at a computer, play guitar, etc. All of these are factors. There are even reports coming out now that small children are showing signs of RSI. My goodness that is a thing of beauty! 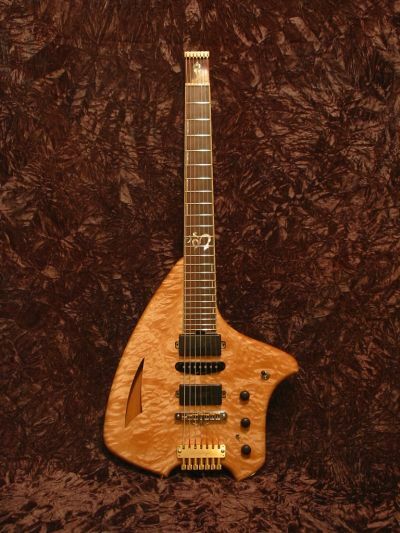 I would like to put a question to those who know everything about it the Forshage and/or Teuffel Tesla guitars. 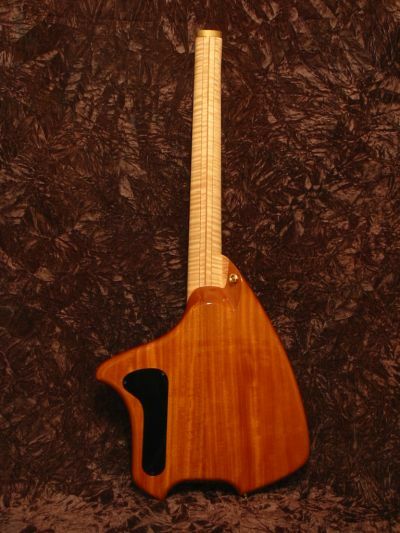 On certain headless custom guitars, such as the Forshage and Teuffel Tesla, the body seems to be contoured like it is carrying in over the necks upper side quite a bit on up, say towards the 13th or 14th fret. 1. Is this just to make the set neck more stable? 2. Does it produces any ergonomic benefits? 3. Is it just pure design astesthetics? I can think that “the-thumb-around-the-neck” bends on solos and blues vibratos will be a little trickier to carry out on the upper frets. Purists who’re stuck to thumb-behind the neck does not care of this, but anyway. I was thinking that this could MAYBE be act as a “lever stopper” or keep the guitar from wiggling and bouncing around when doing fast things, such as tapping. Or that the weight balance and mass is slightly moved forward towards the neck, should the body be of very light wood. Just an observation I’ve made in the past, of both Forshage and Teuffel/Tesla guitars. I think German manufacturer BASSLAB also has one or two basses designed like these of composite material. If you look carefully, you’ll see that the upper region is fairly heavily contoured, likely making it feel as though the neck continues further along. Of course, your thumb won’t be able to hook FULLY over the fretboard, but it won’t feel quite as cumbersome as it might look from the front. I’ve heard of people doing this extended bout for 2 reasons– 1. better placement of the neck button assist correct balancing when worn with a strap; 2. aesthetics. Of course, I can’t say for sure why Chris made his choice, but I suspect it was primarily #1 with a bit of #2. Now, that is intersting, better placement of neck button, when used with a strap. Hmm, wonder how those feels compared to a Klein, in the bouncing around dept. In reference to extending the upper body region into the neck? I think I’ve read this as well. By increasing the glueing surface on the bass side, you can get rid of more wood on the treble side, making for a stable neck with easy access on the treble side, where your hand’s coming from anyway. It also makes the instrument balance better by moving the strap button and the center of gravity more towards the center. I really like a guitar to sit still when played sitting or standing and it does. Right now I am working on one for a guy who values the ability to thumb-wrap in the upper register. It’s going to be more of a neck-through so I can get rid of the bass side wood while leaving sort of a little upper horn(hornette?) sticking out for the strap button. Sounds weird but I think its actually going to be pretty cool! I’ve been learning flamenco for the past few months, which has put all my electrics on standby (and tradition trumps ergonomics). But this focus change has helped make it clear that my orange Forshage is still the one electric I’d grab if my house was burning! And I’ve been through over 50 guitars in my time. So, THANKS and keep up the awesome work dude. @Roger: Welcome back! You’ve been missed. @James – You hit it right on the head. It is, in fact, a compatibility with Firefox. View it through Internet Explorer and you’ll see the missing contact information. Chris is aware of it – I pointed it out a while back. 🙂 In any case, you can reach Chris by writing him at info [AT] forshage [DOT] COM. (Just assemble it back into a normal email address). Thank you, Robert. By the way, when I had tendinitis some years ago, the most authoritative book I found on musicians’ problems with RSIs was Performing Arts Medicine , edited by Robert Thayer Sataloff, M.D., among others. It was quite expensive, and aimed at doctors and surgeons, but it was by far the most comprehensive and scientifically-grounded exploration of musicians’ injuries I ever found (it covers not only guitarists, but all instrumentalists, as well as vocalists and dancers). I think a newer and less expensive version has been published (I had the second edition, from 1998, which was put out by Singular Publishing Group). @James – Thanks so much for the reference! It looks like quite the resource but it sure is one expensive book. Nonetheless, I appreciate it and I’ll look into it further. I really lke the design of the Forshage Ergonomic guitar. Does anyone have any drawings or sketches of the body? Been trying to copy/enlarge some photo’s, but if there are drawings available . .